Make sure the cocoa, cacao, or chocolate you use passed our tests and is right for you! Cocoa powders, chocolates, and other products made from cacao beans can be rich in flavanols — which may help with blood flow, blood pressure, memory, cholesterol levels. But beware: Many products are contaminated with high amounts of cadmium, a toxin you should avoid. In addition, the amounts of flavanols are rarely disclosed, so you have no idea what to expect unless you test them in a lab — which is what ConsumerLab.com has done. 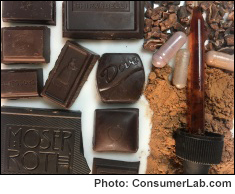 Among dark chocolate bars, our tests revealed that two popular bars to be contaminated with cadmium at several times established limits. And being labeled "organic" did not ensure better quality. Also, the "% cocoa" (or cacao) on labels was often a poor indicator of flavanol levels. In fact, several bars claiming 80% to 85% cacao contained lower amounts of flavanols than bars claiming 56% to 77%. Fortunately, we were able to identify certain dark chocolate bars rich in flavanols and low in cadmium, as well as relatively low in calories -- one of which is our Top Pick for Dark Chocolate. Our tests also revealed high levels of cadmium in most cocoa powders, and some were contaminated with lead, another toxic heavy metal. It would seem best to use cocoa powders in moderation and to avoid two products with shockingly high levels of cadmium. We were able to identify one cocoa powder with a much better ratio of beneficial flavanols to harmful cadmium, making it our Top Pick for Cocoa Powders. If you like cacao nibs (bits of cocoa beans), we tested three — one of which appears to be a better option than the others — making it our Top Pick for Cacao Nibs. We also tested cocoa supplements and identified one providing the most cocoa flavanols — and at the lowest cost: our Top Pick for Cocoa Supplements. You can read the full report now if you're a CL Member. to get You'll immediately get CL's test results for over 40 dark chocolate bars, cocoa powders, cacao nibs, and cocoa supplements along with ConsumerLab.com's reviews, recommendations, and quality ratings. And if you are sensitive to caffeine, you'll want to see how much we found in each product — something not typically listed on labels. Some pack as much caffeine as 1 ½ cups of coffee, while others contain little.